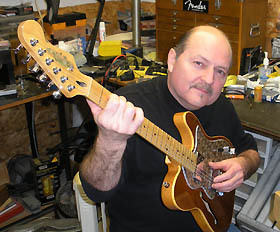 Hayes Guitar Repair Shop was started, in part, as a response to the need of myself, peer musicians, and professionals to setup, maintain, and restore valued and/or depended on instruments. That is of course just part of the story. Like many of you, I love music and have had a life-long commitment to it. I play many types of stringed instruments in many types of styles. In addition to working with our six-stringed instruments, I am also an avid bassist. 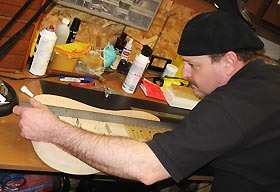 I setup basses for customers who play a wide variety of styles and have collaborated on the building of custom bass guitars. It seems the mysteries and depth of music can never be totally fathomed. The further we explore the musical arts, the more intriguing! Custom Instrument Setup Setting up custom built bass before final finishing. The scope of projects I work on ranges from basic setups to the restoration of severely damaged instruments. I seek to bring all the dynamics together to let you play your best. Music is a major passion of mine; seeing a satisfied–or better yet, a newly inspired customer is a rewarding experience!